The image that I show you today is not as spectacular as yesterday but if it has the same importance. This is an image of the Titan by Cassini probe, one of the Saturn satellites that shows us, in the foreground, the atmosphere of Saturn. Titan is one of the largest satellites in our solar system, but what makes it so special is that it was one of the first in which it was detected that it had an atmosphere. The bands that are observed in the image are clouds of methane and also, we can observe, in the dark zones, lakes of heavy hydrocarbons liquid. 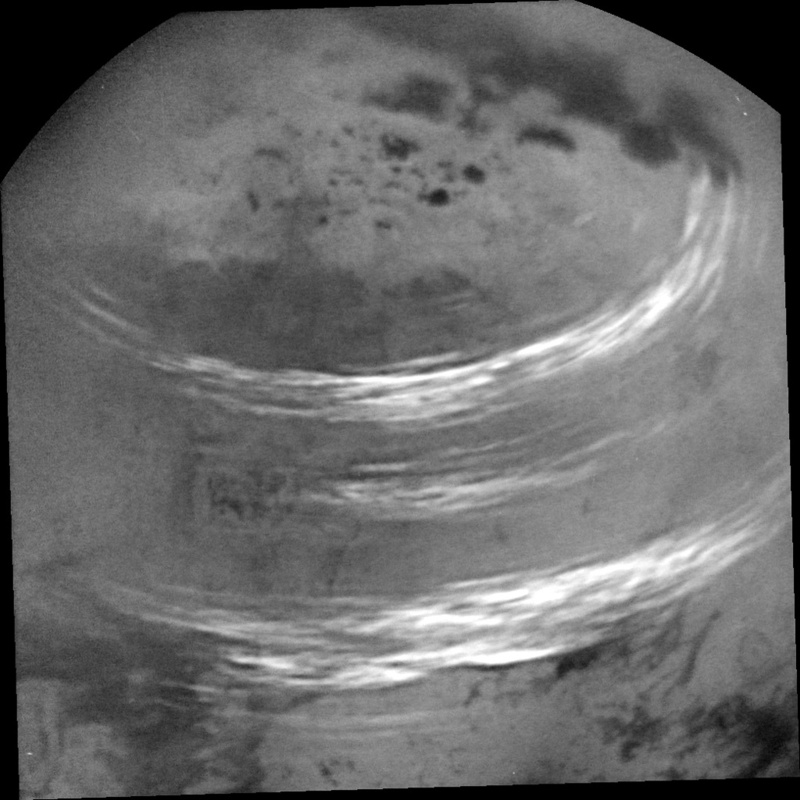 It is thought that Titan has not only surface lakes of hydrocarbons but also has underground areas with this liquid. The orography of the planet, due to the winds of its atmosphere and its surface is mainly ice and rock and all thanks to its rain cycles since it rains liquid methane creates a variety of shapes such as dunes to mountains. Although, as I have said, what is most remarkable is what is called the “methane cycle” similar to the one on Earth that happens to water and has been the first site (outside the Earth) where it has been observed. In addition, despite having no nucleus (its composition is rock and ice compacted at different levels), it has a certain volcanic activity that is thought to be based on the gravity exerted by Saturn and Titan’s orbit on this that causes it to compress and expand it, except that their “volcanoes” instead of throwing magma, throw water and ice. This makes the surface of Titan renewed from time to time, although there are theories that indicate that this “volcanism” is more due to external agents (meteorites) than by the gravity of Saturn. Titan, after all, is a very interesting place in our solar system from which it has been speculated that the presence of methane could help harbor some kind of life that uses this instead of water because methane has “similar Characteristics “to the water. Obviously, this would have to be confirmed because, on Earth, no organism with such capacity has been found. But who knows.